We showed previously that cecal bacterial Ag (CBA)-specific CD4+ T cells induce colitis when transferred into SCID mice. The purpose of this study was to generate and characterize CBA-specific regulatory T cells in C3H/HeJBir (Bir) mice. CD4+ T cells were stimulated with CBA-pulsed APC in the presence of IL-10 every 10–14 days. After four or more cycles, these T cells produced high levels of IL-10, low levels of IL-4 and IFN-γ, and no IL-2, consistent with the phenotype of T regulatory-1 (Tr1) cells. Bir Tr1 cells proliferated poorly, but their proliferation was dependent on CD28-B7 interactions and was MHC class II-restricted. Transfer of Bir Tr1 cells into SCID mice did not result in colitis, and cotransfer of Bir Tr1 T cells with pathogenic Bir CD4+ Th1 cells prevented colitis. Bir Tr1 cells inhibited proliferation and IFN-γ production of a CBA-specific Th1 cell line in vitro. Such inhibition was partly due to IL-10 and TGFβ1, but cognate interactions with either APCs or Th1 cells were also involved. Normal intestinal lamina propria CD4+ T cells had Tr1-like activity when stimulated with CBA-pulsed APCs. We conclude that CD4+ T cells with the properties of Tr1 cells are present in the intestinal lamina propria and hypothesize that these cells maintain intestinal immune homeostasis to the enteric flora. The enteric bacterial flora appears to be the major stimulus for the development of the mucosal immune system, as reflected by the dearth of mucosal lymphoid tissue in adult germfree animals. When germfree animals are given an intestinal flora, their mucosal lymphoid tissue greatly expands along the length of intestine and secretory IgA is produced in quantity. Significant amounts of both Ags and proinflammatory molecules are represented in the enteric bacteria, but little is known about how this flora stimulates the mucosal immune system, whether by nonspecific activators or by specific Ags, or about how this response is limited and controlled. Despite the strong stimulus of the bacterial flora in immune responses, not all bacteria are equally able to stimulate the mucosal immune system (1). Some are more effective than others when given to germfree mice in inducing germinal center reactions in Peyer’s patches (2, 3), stimulating IgA plasma cells in the lamina propria (LP)3 (4), and specific Abs in circulation (5, 6, 7). Despite this bacterial immune stimulus, it is well-recognized that immune responses in the intestine remain in a state of controlled inflammation (8). The mechanisms by which immune homeostasis is maintained in the intestine are poorly understood, but in other immune tissues, the dominant regulatory controls are exerted by the CD4+ T cells. This may be relevant to the observation that mouse intestine develops immunological tolerance to Ags of enteric bacterial flora (9, 10, 11), i.e., mouse intestinal lymphocytes do not proliferate when stimulated with Ags of their own intestinal bacteria but do proliferate when stimulated with Ags of intestinal bacteria isolated from other mice (9). Similar data has been obtained in humans using LP lymphocytes obtained by biopsy which respond to bacterial Ags cultured from other individuals but not to those cultured from the same biopsies (11). Clearly, the interaction of the mucosal immune system with the bacterial flora is complex and poorly understood, with evidence of both immunity and tolerance occurring simultaneously. Strong support for the concept that mucosal immune responses to bacterial flora are tightly regulated come from a number of experimental systems showing that altered regulation of intestinal T cell function can result in chronic intestinal inflammation. This has been evident in a number of newly developed induced mutant and other mouse models, including IL-2 deficiency (12), IL-10 deficiency (13), and a model in which normal CD4+, CD45RBhigh T cells are transferred into syngeneic SCID or RAG−/− recipients (14, 15) in whom they cause colitis, wasting, and death. In the latter model, cotransfer of the reciprocal CD4+, CD45RBlow T cell subset prevents disease, due to the presence in this subset of a regulatory T cell population that produces IL-10 and TGFβ (16, 17). These results indicate that both potentially pathogenic and regulatory T cells are present in normal mice. The stimulus driving such pathogenic and regulatory T cells comes from the enteric bacterial flora because no disease occurs when the animals are raised under germfree conditions (18, 19) and the disease is substantially ameliorated when the animals are raised under specific pathogen-free conditions (20, 21). The bacterial flora is a very complex assortment of Ags, mitogens, and immunomodulators, and in most models it remains unknown which of these factors might be stimulating the pathogenic T cell response. However, in previous work on a spontaneous model of colitis, the C3H/HeJBir mouse, pathogenic T cells responsive to protein Ags of the bacterial flora caused colitis after transfer to histocompatible C3H/HeSnJ scid/scid recipients. Transfer of normal C3H/HeJ CD4+ T cells did not cause disease. Multiple bacterial-reactive CD4+ T cell lines have been derived from C3H/HeJBir mice (22). Most of these are Th1 cells and cause colitis when transferred into C3H-SCID recipients. Interestingly, the adult C3H/HeJBir donors of these pathogenic T cells were not ill, suggesting that regulatory cells were controlling pathogenic T cell activity and preventing disease in vivo. In this study, we report on the presence of CD4+ regulatory T cells in C3H/HeJBir mice, T cells with the characteristics of the T regulatory-1 (Tr1) subset, recently described in a DO11.10 TCR transgenic system (23). Bacterial-reactive Tr1 cells were able to inhibit pathogenic memory Th1 cells in vitro and in vivo using multiple mechanisms. Moreover, CD4+ T cells with the properties of Tr1 cells were identified in the normal mouse intestinal LP. C3H/HeJBir, C3H/HeJ, and C3H/HeSnJ-Pkrdcscid/Pkrdcscid (C3H-SCID) mice were obtained from The Jackson Laboratory (Bar Harbor, ME) and housed in the University of Alabama (Birmingham, AL) animal facility. All studies were approved by the Animal Care and Use Committee of the University of Alabama. RPMI 1640 and FBS were purchased from Life Technologies (Long Island, NY). 2-ME, HEPES, l-glutamine, and sodium pyruvate were purchased from Sigma-Aldrich (St. Louis, MO). mAbs to CD4, CD8, ICAM-1, β7 integrin, CD44, L-selectin, B7.1 (1G10), B7.2 (GL1), I-Ab (25-9-17), I-Ak (11-5.2), and isotype control Abs were purchased from BD PharMingen (San Diego, CA). Anti-TGFβ1 (1D11) was purchased from R&D Systems (Minneapolis, MN). Anti-IL-10R1 (1B1.2) was a gift from Dr. K. Moore (DNAX Research Institute, Palo Alto, CA) and anti-CD40 ligand (CD40L) (MR1) was kindly provided by Dr. B. Kelsoe (National Institutes of Health, Bethesda, MD). Cecal bacterial Ags (CBA) were prepared as previously described (24). Briefly, C3H/HeJ or C3H-SCID mice were sacrificed and their ceca removed. The ceca were opened and placed in 1 ml of PBS. Cecal bacteria were expelled by mixing with a vortex and residual cecal tissue was removed. After addition of DNase (10 μg/ml), 1 ml of this bacterial suspension was added to 1 ml of glass beads. The cells were disrupted at 5000 rpm in a MiniBead Beater (Biospec Products, Bartlesville, OK) for 3 min and then placed on ice. The glass beads and unlysed cells were removed by centrifugation at 5000 × g for 5 min. The lysates were filter-sterilized through a 0.2-μ syringe filter. C3H/HeJBir spleen and mesenteric lymph nodes (MLN) were removed from groups of four to five mice and placed into cell suspension by straining through a small mesh sieve as described previously (25). After two washes, the cells were passed through a nylon wool column to obtain T cells as previously described (26). The column-passed cells were washed twice and treated with rat IgM anti-CD8 mAb (TIB 211; American Type Culture Collection, Manassas, VA) supernatant (1 ml supernatant/1 × 107 cells) for 30 min on ice. After washing three times, magnetic beads coated with anti-rat IgM were added to the cells (BioMag, Cambridge, MA) and incubated for 30 min on ice. After passing through a magnet, CD4+ T cells were collected and reconstituted at 4 × 106 cells per ml in complete RPMI medium containing 10% FCS for use in cell culture. For APCs, spleen cells from C3H/HeJ mice were isolated and treated with 200 μg/ml enteric bacterial Ag at 2 × 107 cells/5 ml in a 15-ml tube overnight at 37°C. After washing twice, the cells were reconstituted at 4 × 106 cells per ml in complete medium containing RPMI 1640 10% FCS, 2 mM l-glutamine, 0.05 mM 2-ME, 100 U/ml penicillin, and 10 μg/ml streptomycin for use in cell culture. These APCs (CBA-APC) were irradiated with 3000 R before being added to T cell cultures. In some experiments, APCs were pulsed with 200 μg/ml proteins extracted from food pellets, or from an intestinal epithelial cell line, Mode K (a gift from Dr. D. Kaiserlian, Batiment Institut Pasteur, Lyon, France). To generate Tr1 cells, 4 × 106 T cells and 4 × 106 CBA-pulsed APCs were cultured per well in 24-well plates in the presence or absence of 10 ng/ml IL-10. T cells were restimulated with freshly prepared CBA-APCs in the presence of IL-10 at intervals of 10–14 days. Th1 and Th2 cells were generated in vitro from CD4+ cells. Briefly, purified CD4+ T cells from MLN of C3H/NeJBir mice were cultured at a ratio of 1:1 with irradiated CBA-pulsed APC. The addition of 50 U/ml IL-12 (R&D Systems) and 10 μg/ml anti-IL-4 (11B11) was used to generated Th1 cells, while 1000 U/ml IL-4 (R&D Systems) and 10 μg/ml anti-IL-12 (C17.8) were used to generated Th2 cells. Recovered cells were washed and restimulated with CBA-APC at the same conditions described above every 2 wk. LP lymphocytes were isolated as previously described (27). Briefly, the intestines from 10 mice were removed, the Peyer’s patches were carefully excised, and the remaining intestine was kept on ice until used. For removal of epithelial cells and intraepithelial lymphocytes, the intestines were washed, cut into small pieces, and then the pieces were incubated with calcium- and magnesium-free HBSS supplemented with 2% bovine calf serum and 5 mM EDTA (Sigma-Aldrich) on a magnetic stirrer at 37°C for 30 min. This process was repeated three times. The tissues were then incubated with RPMI 1640 containing 2% bovine calf serum, antibiotics, 25 mM HEPES and 1.5 mg/ml Dispase (Roche Diagnostics, Indianapolis, IN) for 30 min at 37°C with stirring. The liberated cells were collected by passage through a stainless steel sieve. The digestion was repeated three times. The isolated cells were pooled together and separated on a 40/75% discontinuous Percoll gradient (Pharmacia, Piscataway, NJ) centrifuged at 600 × g, 25°C for 20 min. The cell yield was typically ∼2 × 106 lymphocytes per mouse with >90% cell viability. After two washes, the cells were passed through a nylon wool column to obtain T cells as previously described (26). The column-passed cells were washed twice and depleted of CD8+ T cells as described in the preceding section. T cell lines generated as above were cultured at 2 × 105 cells/well in triplicate in the presence of 2 × 105 Ag-pulsed APC/well in 96-well flat-bottom tissue culture plates (Falcon 3072; BD Labware, Franklin Lakes, NJ) at 37°C in 5% CO2 humidified air. After 3 days of culture, 0.5 μCi of [3H]thymidine (New England Nuclear, Boston, MA) was added to each culture for the last 16–20 h of the incubation period. The cells were harvested on glass fiber filters on a PHD cell harvester (Cambridge Technology, Watertown, MA). Proliferation was measured as the amount of incorporation of [3H]thymidine into cell DNA, as measured by beta-scintillation counting (Beckman Instruments, Palo Alto, CA) of the harvested samples. Data were expressed as mean cpm ± SD. T cell lines were cultured in the presence of APC pretreated with various Ags as described above. Culture supernatants were collected at different times and pooled together for assay. Supernatants collected after 24 h of culture were used for IL-2 assay and the supernatants collected at 48–72 h of culture were used for IL-4, IL-10, and IFN-γ assays. To measure IL-12 production, C3H-SCID spleen APC were cultured with T cell lines under different conditions as described in Table III⇓ text, and the supernatant was collected at 48 h of culture. The cytokine content in supernatants was determined by ELISA. Briefly, 96-well polystyrene microtiter plates (Dynatech Laboratories, Rockville, MD) were coated with primary anti-cytokine capture mAb (2 μg/ml) overnight. After an incubation with sample or cytokine standards, the wells were incubated with biotinylated detection anti-cytokine mAb, followed by an incubation with HRP-avidin. Finally, 50 μl of tetramethylbenzidine was added to each well, and the color development after incubation at room temperature was measured at OD450 in an EL 312e ELISA reader (Bio-Tek Instruments, Winooski, VT). A standard curve was constructed for each assay, and the values of the samples were interpolated using Deltasoft III (BioMetallics, Princeton, NJ) based on Rodbard’s four parameter logistic model (28) on an Apple Macintosh computer (Cupertino, CA). All mAb pairs were purchased from BD PharMingen, and listed by capture/biotinylated detection mAb as follows: IL-2, JES6-1A12/JES6-5H4; IL-4, BVD4-1D11/BVD6-24G2; IL-10, JES5-2A5/SXC-1; IFN-γ, R4-6A2/XMG1.2; IL-12, C17.8/C15.6. Intracellular cytokines were detected by flow cytometry as previously described (29). Briefly, LP CD4+ T cells were stimulated with CBA-pulsed APC in the presence of anti-IL-10R mAb or control Ab. Seven days later, LP CD4+ T cells were restimulated with anti-CD3 (10 μg/ml) and anti-CD28 (10 μg/ml) in the presence of anti-IL-10R mAb or control Ab. After 2 h of culture, brefeldin A (10 μg/ml; BD PharMingen) was added. After a total 5-h culture, the cells were collected, washed in PBS, and stained with anti-CD4 mAb. After fixation with 2% formaldehyde, the cells were permeabilized by incubation in PBS supplemented with 2% FCS and 0.5% saponin (BD PharMingen). Permeabilized cells were stained with PE-labeled anti-IL-4, or anti-IFN-γ and APC-labeled anti-IL-10 mAbs (BD PharMingen). After washing, the cells were analyzed using a FACScan flow cytometer (BD Biosciences, Mountain View, CA), and data were analyzed with CellQuest software (BD Biosciences). A PE- or APC-labeled control mAb of the same isotype was used as a negative control in all experiments. For CD4+ Bir T cell transfers, T cell lines were harvested 5 days after restimulation with CBA-APCs. Dead cells were removed by centrifugation over lympholyte-M (Cedarlane Laboratories, Hornby, Ontario, Canada), then 2 × 106 T cells were transferred i.v. into C3H-SCID recipients. Three months later, the recipients were killed and the cecum and the proximal, middle, and distal portions of colon were fixed in formalin. If animals looked ill and had lost >20% of initial body weight they were sacrificed at that point along with a randomly selected animal from the control group. Fixed tissues were embedded in paraffin, and sections were stained with H&E for histologic examination. All slides were read by an experienced pathologist (A.L.) without knowledge of their origin. The results were expressed as the mean ± SD. The significance of the difference between means was determined by the Mann-Whitney test, and differences were considered statistically significant with p < 0.05. To generate an enteric bacterial Ag-specific Tr1 cell line, MLN CD4+ T cells of C3H/HeJBir mice were repeatedly stimulated with CBA-APC in the presence of IL-10. Such cultures expand memory T cell subsets that have been primed in vivo. After several cycles of stimulation, cytokine production in the culture supernatants was measured. As shown in Fig. 1⇓A, the resulting T cells (Tr1) produced high levels of IL-10, and low amounts of IL-4 and IFN-γ, with no IL-2 production, and small amounts of TGFβ, consistent with the cytokine profile of Tr1 cells described by Groux et al. (23). These cells proliferated poorly to CBA-APC stimulation compared with the Th1 or Th2 cells with the same CBA specificity (Fig. 1⇓B). 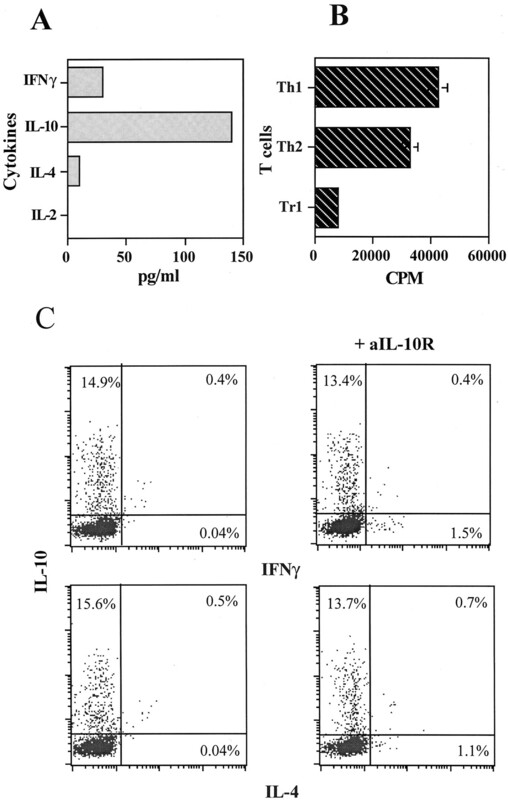 Intracellular cytokine staining showed that most Tr1 cells produced only IL-10 (Fig. 1⇓C). To determine the Ag specificity of CBA-specific Tr1 cells, their ability to proliferate was measured after stimulation with APCs pulsed with CBA, food, epithelial, or unrelated Ags. They responded to CBA-pulsed APCs, but not to APCs pulsed with epithelial cell, food, or unrelated protein Ags such as OVA (Table I⇓). Cytokine production and proliferative responses of Bir Tr1 cells upon stimulation with CBA. A, Tr1 cells (2 × 105) were cultured with 4 × 105 CBA-pulsed APC. The supernatants were collected at day 1 for IL-2 assay and at day 3 for IL-4, IL-10, and IFN-γ assay. Cytokines were measured by ELISA. B, Tr1, Th1, or Th2 cells (2 × 105) were cultured with 4 × 105 CBA-pulsed APC. [3H]TdR (0.5 μCi) was added to the wells for the last 18 h of a 5-day culture. Results are expressed as mean cpm ± SD of triplicate cultures and are representative of three experiments with similar results. C, Intracellular cytokine staining of Bir Tr1 cells after stimulation with anti-CD3 plus anti-CD28 in the absence or presence (+αIL-10R) of anti-Il-10R. To determine whether the Bir Tr1 cell response to enteric bacterial Ags was MHC class II-restricted, mAbs to MHC class II I-Ak and I-Ab molecules were added into the culture of Bir Tr1 cells with CBA-pulsed APCs. Addition of anti-H-2k mAb, but not the irrelevant control anti-H-2b mAb, reduced Tr1 cell proliferation to CBA-APCs by 70%, indicating that the CBA-specific response was MHC-dependent. As shown in Fig. 1⇑B, Tr1 cells proliferated poorly to CBA stimulation. Various Abs against different cytokines were added into the Bir Tr1 cell culture separately or in different combinations. Addition of anti-IL-2 did not affect Tr1 cell growth. Anti-IL-10 affected cell growth slightly or not at all. In contrast, anti-IL-4 Ab inhibited Tr1 cell growth, but never completely (Fig. 2⇓A), indicating that IL-4 is partially responsible for Tr1 cell growth. Addition of exogenous recombinant IL-2, IL-4, or IL-10 had no effect on proliferation of Tr1 cells (data not shown). Cytokine and costimulatory molecule requirements for Tr1 cell activation. Tr1 cells (2 × 105) were cultured with 4 × 105 CBA-pulsed APC in the presence of Ab against various cytokines (A) or against costimulatory molecules (B). [3H]TdR (0.5 μCi) was added to the wells for the last 18 h of a 5-day culture. Results are expressed as mean cpm ± SD of triplicate cultures and are representative of three experiments with similar results. To determine which costimulatory molecules were involved in Tr1 cell activation, anti-B7.1, anti-B7.2, and anti-CD40L mAb were added into cultures of Tr1 cells plus CBA-APC. Tr1 cell proliferative responses were slightly inhibited by addition of anti-B7.1, and strongly inhibited by addition of anti-B7.2 mAb. Addition of both anti-B7.1 and anti-B7.2 almost completely inhibited Tr1 cell responses to CBA-APC stimulation. Addition of anti-CD40L Ab had no effect on Tr1 cell proliferative responses to CBA-APC stimulation (Fig. 2⇑B). We have established previously pathogenic CBA-reactive Th1 cell lines from C3H/HeJBir mice that cause colitis in all C3H-SCID recipients upon transfer (22). Tr1 cells were irradiated and added to the cultures of pathogenic Th1 cells plus CBA-APC. Then T cell proliferation was measured after a 5-day culture. As shown in Table II⇓, Th1 cells responded strongly to CBA stimulation, and this Th1 cell response was inhibited by the presence of Tr1. Similar results were obtained when IFN-γ production was measured; Th1 cells produced high amounts of IFN-γ, and this IFN-γ production was inhibited by Tr1 cells (data not shown). To determine whether cytokines produced by Tr1 cells caused such inhibition, Abs against different cytokines were added into these Th1-Bir 8 cultures. Addition of anti-IL-4 had no effects on inhibition by Tr1 cells. Addition of anti-IL-10R1, anti-TGFβ1 or both Abs reversed Tr1 inhibition partially. Anti-IL-10R1 had a greater effect than did anti-TGFβ1. Because neither anti-IL-10 or anti-TGFβ Ab completely blocked Tr1 cell inhibition of pathogenic Th1 cell responses, it seemed possible that Tr1 inhibition required cell contact as well as soluble factors. To determine whether cell contact was required, a transwell culture system was used. Tr1 cells were added into the upper wells with CBA-APC and pathogenic Th1 cells were added into the lower wells with CBA-APC. Such cultures were compared with those in which both Tr1 and Th1 cells were cultured together with CBA-APCs in the lower wells. 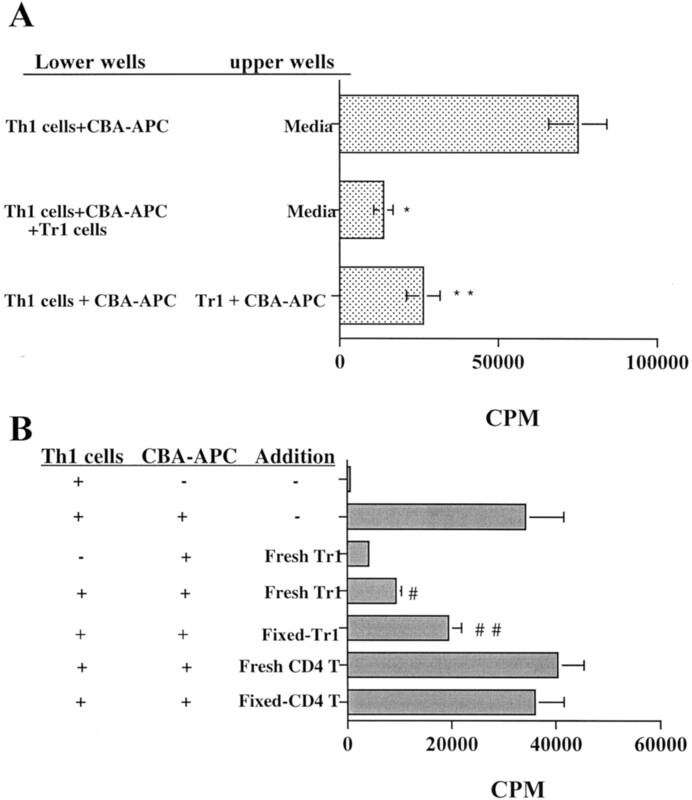 Tr1 cells in the upper wells were able to inhibit Th1 cell response to CBA stimulation in the lower wells, but to a lesser extent than when Tr1 cells were added together with Th1 in the same lower wells (Fig. 3⇓A), indicating that Tr1 cell inhibition of pathogenic Th1 cell responses required some cell contact. In additional experiments, we activated Tr1 cells with CBA-pulsed APCs for 2 days in vitro, then fixed them in paraformaldehyde. Such paraformaldehyde-fixed Tr1 cells inhibited the Th1 cell response to CBA-APC, but less so than did unfixed Tr1 cells (Fig. 3⇓B). Both soluble and cognate factors contribute to inhibitory function of Tr1 cells. A, In transwell culture, Th1 cells plus CBA-pulsed APC were added into lower wells (top bar). The upper wells contained either Tr1 cells plus CBA-pulsed APC (bottom bar) or medium alone (top and middle bars). [3H]TdR was added to the lower wells for the last 18 h of a 5-day culture. ∗, p < 0.005 vs Th1 cells + CBA-APC in lower wells and medium in upper wells; ∗∗, p < 0.05 vs Th1 cells + CBA-APC + Tr1 cells in lower wells and medium in upper wells (p < 0.05). B, Tr1 cells were activated with CBA-pulsed APC for 2 days and fixed with paraformaldehyde. The fixed Tr1 cells were then added into the culture of Th1 cells in the presence of CBA-pulsed APC. Results are expressed as mean cpm ± SD of triplicate cultures and are representative of three experiments with similar results. #, p < 0.005 vs Th1 cells + CBA-APC (p < 0.005); ##, p < 0.05 vs Th1 cells + CBA-APC. Pathogenic Th1 cells reactive to enteric bacterial Ags induce IL-12 production by APC, which is essential to the induction of colitis by these pathogenic T cells (22). To determine whether Tr1 cells inhibited APC IL-12 production, they were added to cultures of Th1 cells with CBA-APC. Two days later, supernatants were collected and IL-12 p40 production was measured by ELISA. Th1 cells strongly induced IL-12 production by CBA-APC. Such IL-12 production was inhibited by Tr1 cells (Table III⇓). Interestingly, addition of anti-IL-10R1 Ab reversed the Tr1 cell inhibition of APC IL-12 production, indicating that the Tr1 inhibition of APC IL-12 production was mediated by IL-10. Anti-TGFβ1 did not reverse the inhibition of IL-12 by Tr1 cells (data not shown). To investigate the ability of CBA-specific Tr1 cells to prevent colitis induced by pathogenic Th1 cells in vivo, groups of four C3H-SCID mice were given either 1 × 106 Tr1 cells, 1 × 106 pathogenic Th1 cells, or both together. Three months after cell transfer, the recipients were sacrificed and the histopathology of the small intestine, cecum, and the proximal, middle, and distal portions of colon were examined. Bir Tr1 cells did not cause colitis in any recipients. All four recipients of pathogenic Bir Th1 cells developed colitis (Fig. 4⇓B). The lesions in the recipients were focal and prominent in the cecum and proximal colon, as previously described (22). The small intestine of these recipients did not show any inflammation. Interestingly, none of recipients that received both Tr1 cells and pathogenic Th1 cells developed disease (Fig. 4⇓A) indicating that this Tr1 subset could inhibit the potent pathogenic effects of an activated, memory Th1 cell line in vivo. Histopathology of the colon of C3H/HeSnJ scid/scid mice that had received 1 × 106 Bir Tr1 cells, 1 × 106 Bir Th1 cells, or 1 × 106 Tr1 and 1 × 106 Th1 cells. 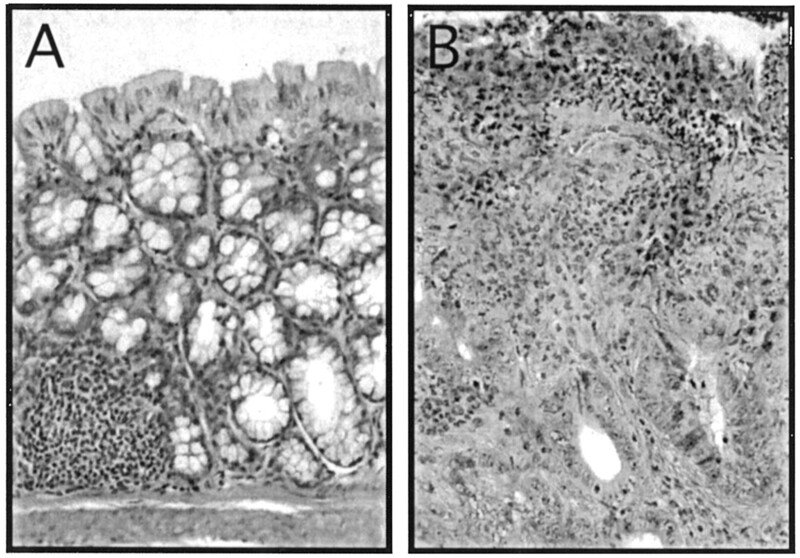 Ten weeks after transfer, the colon of the recipient of Th1 cells had inflammation and a focal ulcer (B), whereas the colon of the recipients of both Tr1 and Th1 cells shows normal histology (A). LP CD4+ T cells from normal C3H/HeJ mice were isolated and added into cultures of pathogenic Th1 cells in the presence of CBA-pulsed APC or unpulsed APCs plus anti-CD3/CD28. T cell proliferation and IFN-γ production were measured. As shown in Table IV⇓, T cell proliferation was inhibited by LP CD4+ T cells in response to CBA-APC. In contrast, LP CD4+ T cells did not inhibit the cell response to anti-CD3/CD28 stimulation, suggesting that LP CD4+ T cells inhibit Th1 cells indirectly via effects on APCs. Interestingly, addition of anti-IL-10R1 mAb, but not anti-IL-4 mAb, partially abrogated LP CD4+ T cell inhibition of the Th1 response, consistent with IL-10 being involved in LP CD4+ T cell inhibition. LP CD4+ T cells from C3H/HeJ mice were isolated and stimulated with CBA-pulsed APCs. Culture supernatants were collected at day 1 for measuring IL-2 and at day 3 for measuring IL-4, IL-10, and IFN-γ. As shown in Table V⇓, only IL-10, but not IL-2, IL-4, and IFN-γ, production was detected in culture supernatants. Interestingly, when anti-IL10R1 mAb was added into culture, both IL-10 and IFN-γ production were detected. To determine the cellular source of these cytokines, LP CD4+ T cells were cultured with CBA-pulsed APCs for 1 wk in vitro. The cells were then restimulated with anti-CD3 plus anti-CD28. Brefeldin A was added into LP CD4+ T cell cultures at 2 h and the cells were harvested and stained at 5 h of culture. As shown in Fig. 5⇓, ∼10% of LP CD4+ T cells were IL-10+, and almost none of the LP CD4+ T cells were IFN-γ+ (0.2%) or IL-4+ (0.3%). (Fig. 5⇓, A and C) when stimulated with enteric bacterial Ags. When anti-IL-10R1 mAb was added into culture, 9.4% LP CD4+ T cells remained IL-10+ but 4.8% were IFN-γ+ (Fig. 5⇓D) and still very few were IL-4+ (0.5%) (Fig. 5⇓B). 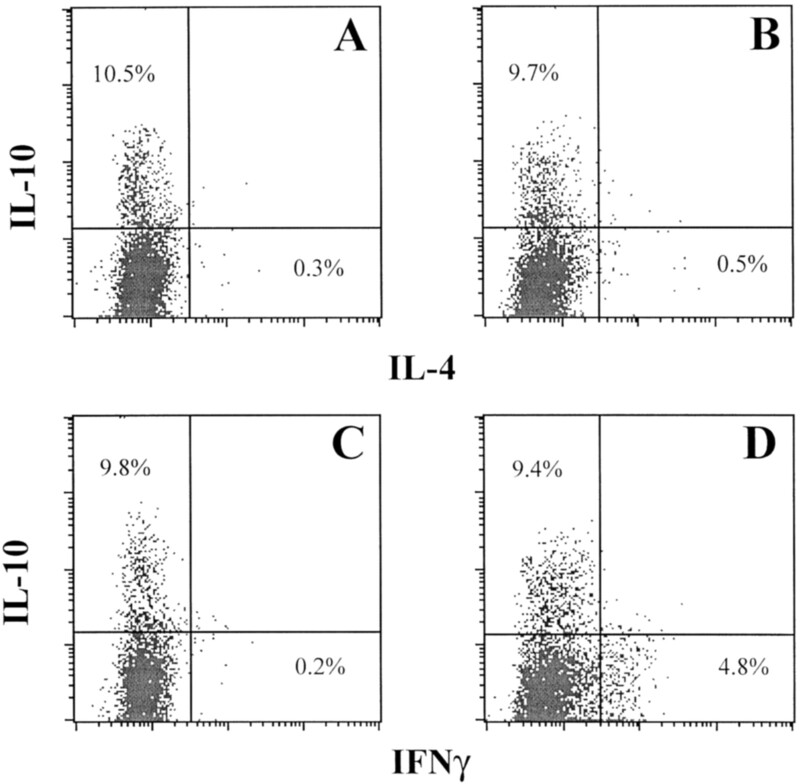 Notably, no LP CD4+ T cells coexpressed IL-10 and IFN-γ (Fig. 5⇓D). Intracellular cytokine staining of LP CD4+ T cells after stimulation of CBA-pulsed APC in vitro. LP CD4+ T cells were cultured with CBA-pulsed APC in the presence of anti-IL-10R mAb or control Ab for 7 days. Then LP CD4+ T cells were restimulated with anti-CD3 and anti-CD28 in the presence of anti-IL-10R mAb (B and D) or control Ab (A and C). Brefeldin A (10 μg/ml) was added after a 2-h culture. After a total 5-h culture, the cells were stained with FITC-anti-CD4 mAb, PE-labeled anti-IL-4, or PE-labeled anti-IFN-γ and APC-labeled anti-IL-10 mAbs. The intestine contains a massive quantity of resident bacteria that are a significant source of both Ags and proinflammatory molecules. Despite this potent immune stimulus, it is well-recognized that immune responses in the intestine remain in a state of controlled inflammation, which indicates that the mucosal immune responses to the bacterial flora are tightly regulated. However, little is known about how this intestinal immune homeostasis is maintained. In this report, we provide evidence that one mechanism that maintains homeostasis is the presence of regulatory CD4 T cells in the mucosal LP. These regulatory CD4+ T cells were initially identified in C3H/HeJBir mice, which are highly susceptible to the development of colitis. Under certain housing conditions, mice of this strain can develop colitis spontaneously early in life, a disease from which they recover (30). Pathogenic CD4+ T cells reactive with enteric bacterial Ags are present in adult C3H/HeJBir mice and can cause colitis upon transfer to C3H-SCID recipients, even though the donor mice have recovered and no longer have colitis (22, 25). This prompted us to look for regulatory T cells in C3H/HeJBir mice. The approach was to repeatedly stimulate CD4+ T cells with CBA-APC in the presence of IL-10, because this technique had been reported to generate a regulatory T cell population (Tr1) in TCR transgenic DO11.10 mice (23). Indeed, the C3H/HeJBir regulatory T cells that grew out had characteristics of the Tr1 subset, in that they produced high amounts of IL-10, low levels of IL-4 and IFN-γ, and no IL-2. More importantly, when cotransferred with pathogenic Th1 cells reactive to enteric bacterial Ags, these Tr1 cells prevented colitis, indicating that Tr1 cells can function in vivo as regulatory cells. The protective effect of regulatory T cells has been observed in several experimental model systems. A variety of organ-specific autoimmune diseases that arise in mice thymectomized at day 3 of life can be prevented by administration of CD4+CD25+ T cells (31, 32). In thymectomized and irradiated adult PVG.RT1u rats, the onset of autoimmune diabetes can be prevented by transfer of CD4+CD45RClow, RT66 T cells (33, 34). In nonobese diabetic female mice, thymectomy at weaning prevents the generation of protective cells and thus accelerates the onset of diabetes (35). CD4+ T cells from nondiabetic young mice prevent the transfer of diabetes by splenocytes from diabetic mice (36, 37). CD4+αβ T cells also confer protection from spontaneous experimental autoimmune encephalomyelitis (38). Thus, the existence of regulatory T cells capable of protecting against autoimmune diseases, or allowing transplantation, has been supported by data from several laboratories and it is likely that several types of regulatory T cell subsets exist. Recently, T cell subsets have been identified that have regulatory function in the mucosae. One of these, denoted Tr1, produces high amounts of IL-10; another, denoted Th3, produces TGFβ1. Both subsets appear to be involved in mucosal immune regulation in that deletion of genes encoding their effector molecules, their receptors, or their critical signal transduction molecules all result in chronic intestinal inflammation (13, 39, 40, 41, 42). To study the mechanisms mediating Bir Tr1 cell inhibition of Th1 cells, Tr1 cells were cocultured with pathogenic Th1 cells in vitro. Bir Tr1 cells substantially inhibited Th1 cell responses to enteric bacterial Ags, in that both Th1 cell proliferation, as well as IFN-γ production was decreased. This Bir Tr1 cell inhibition was mediated in part by production of IL-10 and TGFβ, in that addition of anti-IL-10R1 mAb or anti-TGFβ1 mAb partially blocked the Bir Tr1 inhibition. Interestingly, addition of both anti-IL-10R1 and anti-TGFβ1 did not reverse the inhibition by Tr1 cells more than the addition of either alone, indicating that IL-10 and TGFβ1 did not work synergistically. This is similar to the CD45RBlow regulatory T cell inhibition of colitis induced by CD45RBhighCD4+ T cells in that this inhibition was abrogated by either anti-IL-10R1 mAb or anti-TGFβ1 mAb (16, 17). Yet a third molecule involved in the Bir Tr1 cell regulation of Th1 responses appears to be a cell surface molecule. The lack of complete reversal of inhibition by anti-IL-10R1 and anti-TGFβ1 alone or in combination indicated that these two inhibitory cytokines could not account for the entire inhibitory effect. A transwell experiment confirmed the importance of cell contact in that inhibition was less when the regulatory and effector cells were not in contact in the same wells. More convincingly, Bir Tr1 cells that had been activated with CBA-APC and then fixed were still able to inhibit Th1 cells in vitro (Fig. 3⇑B). The cell surface activity involved in Bir Tr1 cell function is not yet identified. The involvement of cytokines (IL-10, TGFβ) as well as cognate interactions by Bir Tr1 cells in vitro is different from the effects of CD25+CD4+ T regulatory cells (31, 32, 43, 44, 45), which require cell-cell contact, but not soluble factors when measured in vitro, even though in vivo the inhibition did involve TGFβ1 (45). There is evidence that cell contact-dependent immunosuppression by CD4+CD25+ regulatory T cells is mediated by cell surface-bound TGFβ1 (45). CTLA-4 had been shown to play an essential role in the function of CD25+CD4+ regulatory cells (43, 44). The role of CTLA-4 in Tr1 cell function remains to be defined. Bir Tr1 cells were specific for enteric bacterial Ags in that they proliferated to such enteric bacterial Ags, but not to food or epithelial Ags. The Bir Tr1 cell responses to enteric bacterial Ags were restricted by MHC class II, compatible with stimulation through the TCR. Tr1 proliferation was weak compared with Th1 and Th2 cell lines with similar reactivity. Interestingly, addition of either anti-B7.1 or anti-B7.2 Ab partially inhibited Bir Tr1 cell proliferation, but both together greatly inhibited it. In contrast, addition of anti-CD40L had no effect on Bir Tr1 cell proliferation, indicating that Tr1 cell proliferation required CD28-B7, but not CD40L-CD40, costimulation. Both pathogenic Bir Th1 lines (22) and Bir Tr1 cells (data not shown) were pauciclonal rather than polyclonal, and used TCRBV 6, 8, and 14 predominantly, the same TCRBV expressed by LP CD4 T cells in C3H/HeJBir mice (22). Whether these effector and regulatory T cells respond to the same or different bacterial Ags remains unknown. Intestinal LP T cells have increased activation markers (46), increased levels of cytokine gene expression (47), and have a higher proportion of cells bearing the CD45RO marker (48), consistent with their being highly enriched for memory cells. Remarkably, little is known about T cells in the mucosa that are reactive to Ags of the very abundant enteric bacteria. We present data in this study that LP CD4+ T cells contain regulatory T cells that recognize enteric bacterial Ags. When added into enteric bacterial Ag-specific Th1 cell cultures in the presence of CBA-APC, LP CD4+ T cells inhibited Th1 cell proliferation as well as IFN-γ production, partly due to secretion of IL-10. These results are strikingly similar to the results obtained with Bir Tr1 cells and show that enteric bacterial Ag-specific CD4+ cells with regulatory activity were present in normal intestinal mucosae. Interestingly, upon enteric bacterial Ag stimulation, both IL-10 and IFN-γ were detectable after IL-10 functional activity was blocked by addition of IL-10R-1 mAb. Intracellular staining confirmed the above observation and clearly showed that IL-10 and IFN-γ were produced by separate LP CD4+ T cell subsets. These results are compatible with previous work that identified both IL-10-producing and IFN-γ-producing CD4+ T cell subsets in the intestinal LP of DO11.10 mice (49, 50). These data suggest that both Tr1 and Th1 cells are present in the LP and that regulatory T cells appear to play a dominant role in controlling mucosal immune responses to enteric bacteria and preventing inflammation in the mucosa. ↵1 This work was supported by National Institutes of Health Grant PO1 DK44240. 3 Abbreviations used in this paper: LP, lamina propria; Tr1, T regulatory-1; CD40L, CD40 ligand; CBA, cecal bacterial Ag; MLN, mesenteric lymph node. Berg, R. D.. 1983. Host immune response to antigens of the indigenous intestinal flora. D. C. Savage, ed. Human Intestinal Microflora in Health and Disease 101 Academic Press, New York.